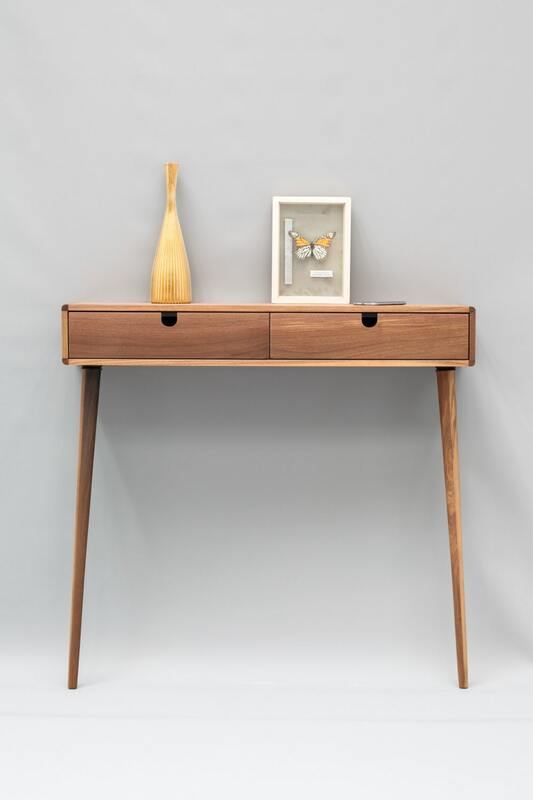 Hallway console inspired by Scandinavian mid-century design. So stylish in its simplicity. 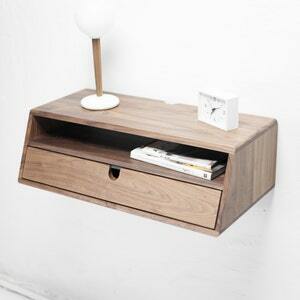 It features tapered legs and two drawers with carved round-outs for a sleek, hardware-less look. 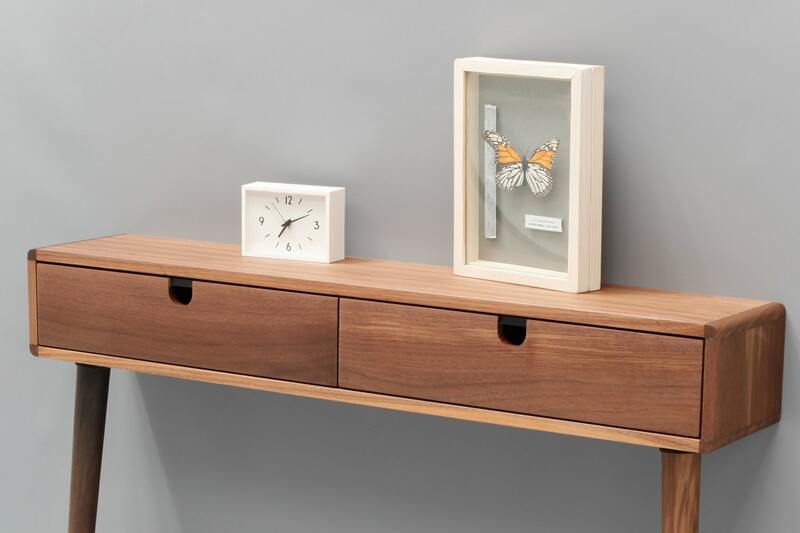 Handcrafted from solid wood with stunning grains, this piece features beautiful craftsmanship and superior joinery to last forever. Handmade in Spain. A matte acrylic varnish is applied to the wood, leaving the pore open and applying natural wood oil to protect. The console is designed to float on the wall, attached to the wall , it's a moderately easy install for someone with basic tools (drill, and a screwdriver). With built-in level bubble for easy installation. 100% solid wood board except for plywood on bottom of drawers and back panel. - Width 98.5 cm / 38.77 "
- Depth 25 cm / 9.8 "
- Height 12.4 cm / 4.88 "
- Drawer height 12,4 cm / 4.88 "
- Total height 77.3 cm / 30.4 "
Clean when needed with a soft cloth following the grain pattern, after removing the possible abrasive dust particles. Clean it periodically with a moist cloth. Dry immediatly with soft cloth following wood grains. Remove stains using a mild mixture of water and detergent. The furniture should not be subjected to excessive humidity, heat or direct sunlight. If the wood looks dry or whitish apply any commercial wood oil , better transparent or yellow for oak. Also apply oil in the metal parts for avoiding oxidation. when applied the wood will absorb the quantity needed , retire the excess oil with a dry cloth within some hours. Any questions don´t hesitate asking. To fulfil your order, you must provide me with certain information (which you authorized Etsy to provide to me), such as your name, email address, postal address, payment information, and the details of the product that you’re ordering. 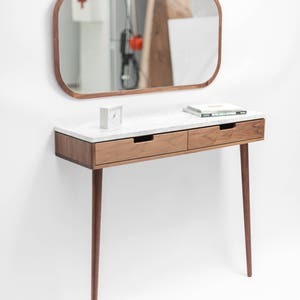 You may also choose to provide me with additional personal information (for a custom order of Furniture, for example), if you contact me directly. I engage certain trusted third parties such UPS, Fedex ,TNT to perform functions and provide services to my shop, such as delivery companies. I will share your personal information with these third parties, but only to the extent necessary to perform these services. We love custom orders , don´t hesitate to ask for an estimate. We supply high-quality furniture grade wood. This may vary for grain, colour, knots and other markings. We do our best to select and match as appropriate but we cannot accept returns on the basis of natural variations. Any special requirements for colour, matching, etc. must be provided. We purchase and supply furniture grade 1 (FAS) wood which has been dried to correct moisture content but sometimes warpage, shrinkage etc, can still occur, especially when the furniture is shipped to drier climates from where it was made. We will accept returns if the timber was not appropriately dried but we cannot accept returns that stem from climactic differences. Should movement occur in the wood addressing issues of temperature and moisture usually resolves the issue. 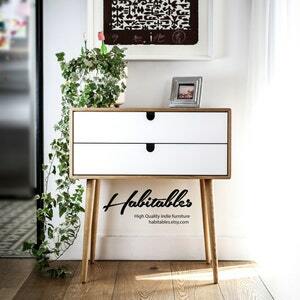 Habitables does not accept refunds, cancellations, or returns. 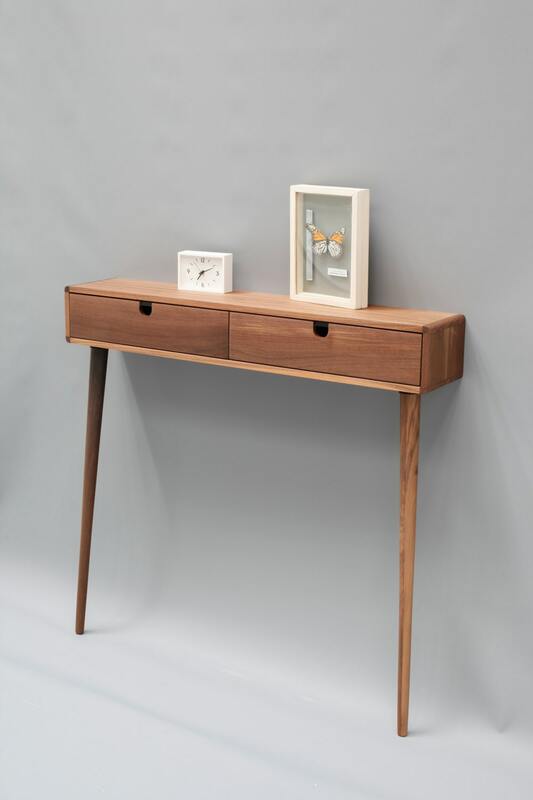 Our furniture is built to order and the process begins as soon as payment is received. Changes to your product may not be made after purchase. Please double check the details of your order before submitting. Happy customers are very important to us. Please contact us with any questions or concerns about your order. Gorgeous. Very high quality workmanship. Love it. Mère photos don't begin to do justice to this gorgeous table. From the moment it emerges from its packing materials, it is a delight to behold and to touch. 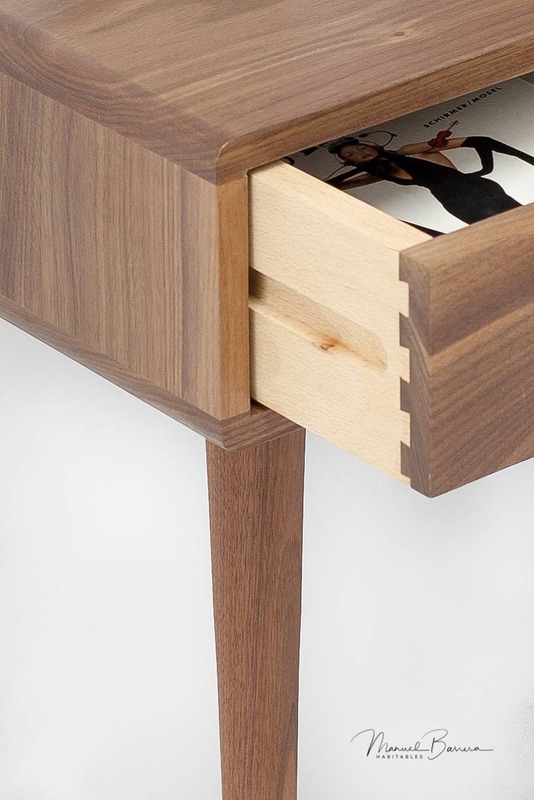 It looks like it is made from a single piece of wood, so beautiful with the grain apparent and so well-matched across the drawers that I wish I knew the story of the tree itself, too. 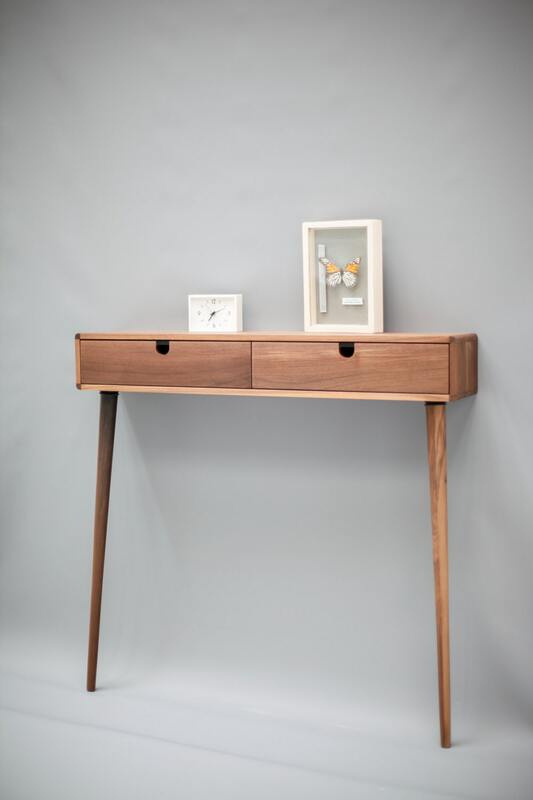 The workmanship is superb, from the clever inset handles in the drawers to the flawless joins at either of its curved ends. It's a tactile delight, too -- the surface is incredibly smooth and lovely to touch. I feel like I've traveled back in time and found an atelier where artisans work to produce labors of love and ingenuity. I'm going to peruse the rest of Manuel's collection to see what other lovely things I could add to our home. Wow, wow, wow! Excellent communication and responsiveness from the seller, and the piece came expertly packaged without damage. The quality of the craftsmanship is top notch. I'm really happy with my order!